Late May, June and July we travel back to the “Land of the Midnight Sun” for affordable Alaska Salmon fishing, on the Kenai River. Wet & Wild provides it’s clients with World Class Alaska King Salmon Fishing. Jeff Moore, your expert Kenai River Guide will take you out for your personal Kenai River fishing tour. 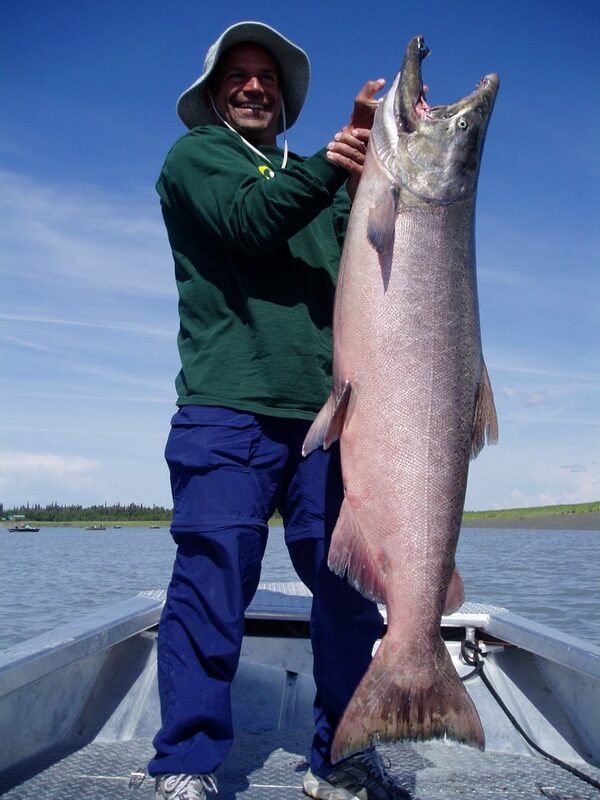 The tides from Cook Inlet bring King Salmon to the Kenai River on a daily basis and not just salmon, the largest King Salmon found anywhere in the world, a record 97.4 pound Alaska King Salmon, was caught just downstream on the Kenai River. Come fish with Wet & Wild Alaska Fishing affordable world class Alaska King Salmon Fishing at its best. Did we mention that Jeff Moore had the largest King Salmon caught on the Kenai River in 1989 weighing in at 89lb 3oz? What does this mean to you? This means Jeff with his over 30 years of experience knows where the monster king salmon are and he knows how to catch them. Fish on! The Alaska King Salmon goes by many names, Chinook Salmon, in other areas along the west coast, they might refer to them as, Tyee Salmon or Springers. They are the largest species of Salmon in the pacific. The King Salmon are an anadromous fish native to the river systems of western North America from California to Alaska. The king Salmon is a prized and much sought after catch for the sportsman. The King Salmon has a bluish green tint to its back and silver sides. It has silver sides and white ventral surfaces with black spots on it’s tail and upper half of it’s body. Adult King Salmon can range in size from 30 to 48 inches but can reach as large as 60 inches. While they average 30 to 40 pounds they can reach sizes as large as 126 pounds (commercial caught fish). The current sport caught World Record is 97.25 pounds and was caught in May 17th, 1985 in the Kenai River. Book your Alaska Kenai River King Salmon Fishing Trip today with Jeff Moore of Wet & Wild Alaska Fishing. Contact us today! First and foremost, we don’t just view you trip to the Kenai River as another fishing trip, we know this may be the first and possibly your only trip to Alaska. Wet & Wild Alaska Fishing understands that and will show you the trip of a life time. 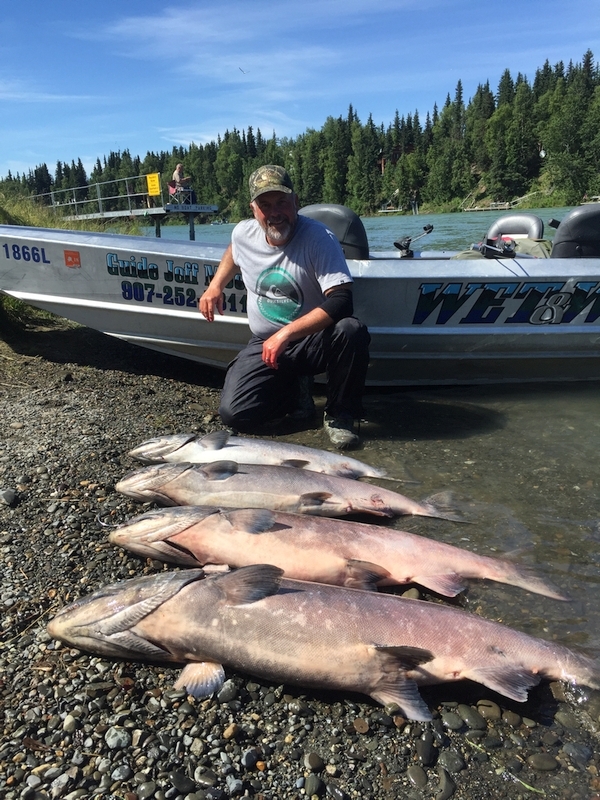 Jeff Moore at Wet & Wild Alaska Fishing has been a Kenai river guide for over 30 years and unlike some other guides actually lives out here. Jeff Moore will give you a world class fishing trip, just read his customers testimonials and see what other clients are saying. Client pickup is at 5:30am, we start fishing at 6:00am, this is Alaska Salmon Fishing at it’s best. Bring your snacks, beverages, and lunches for the day. We will fish a full fishing day, or a limit, returning to the boat ramp. If the Kenai River King Salmon Fishing is good with lots of fish, we will catch and release a few, with your Kenai River Guide, with first class equipment, and service with all of the professional attention you deserve. When we finish our day at 3:00 pm, Jeff will clean your fish, filleting and bagging your catch. There are several local processors that will vacuum seal your catch and freeze it, if requested. All of your fish will be processed, packed in wax boxes and prepared for your trip home. There is nothing like having friends over to show off your fishing trips pictures, video and best of all open one of these wax boxed stuffed with King Salmon, Sockeye Salmon, Silver Salmon or Halibut. Get ready for some of the best fish in your life, fresh from the Kenai River. Contact Wet & Wild Alaska Fishing today to book your King Salmon fishing trip of a lifetime!